Each one of the schools at which I teach digital photography classes have finalized their class offerings, mailed their catalogs and are accepting both online and walk-in registrations. I continue to teach classes for PV NET that are not directly offered by either Torrance or the South Bay Adult School. For example, beginning in January, I will be teaching a class that is focused on taking and processing RAW images using the PSE 8 built-in Adobe Camera RAW Editor. Even if you do not shoot RAW, you will learn how to process JPEG images using the ACR editor. To find out more about this class and how to register, CLICK HERE. To view the descriptions and schedule for the classes I will be teaching at the South Bay Adult School, CLICK HERE. I continue to teach all of my classes each term at Torrance. To see their descriptions and schedule for the Winter term, CLICK HERE. None of the schools have upgraded to PSE 9 as of yet. However, this should not be an issue for those of you who have upgraded to the newest version. Almost every one of my handouts have been re-written for PSE 9. There are only a few differences from recent previous versions in the user interface and commands. Any significant differences are explained during class. The result is you should be able to directly apply what you learned in class at home regardless of what version of PSE you use. One final note. For those of you who use Macs, PSE 9 now includes the Organizer, as well as the Editor. What that means is now the Organizing class at Torrance, for example, is directly applicable to Mac users. Have you ever wanted to combine the adjustments or effects you’ve applied on different layers without flattening the image? I have. For example, generally I like to sharpen my image after I’ve completed everything else. One way to do this is to flatten the image, and then sharpen it. A better, non-destructive way is to combine all of the layers into a composite layer and then sharpen that layer. In Photoshop Elements this can be done using a keyboard shortcut command. The Undo History calls this command Stamp Visible. The shortcut itself is Ctrl+Shift+Alt+E. To apply it, make your top layer the active layer, and then apply the shortcut. The result is a new layer on top of the layer stack that has incorporated all of the adjustments applied in the layers below. See Layer 2 in the figure below. Now that you have a composite layer you can sharpen or anything else you would like to do. 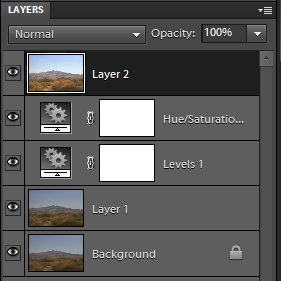 If you don’t like results you have applied to this layer, or you would like to fine-tune the adjustments on the layers beneath it, simply delete the composite layer, Layer 2 in the figure. As far a I know the shortcut is the only way to apply this command. It does not appear in the Menu. I will be teaching a class for PV NET on working with camera RAW images in Photoshop Elements 8. The class begins Monday January 10, 2011 at 10:00am. The description and how to register for the class are on the PV NET Page at the top of this screen, or you can CLICK HERE. Remember, these classes can fill up quickly, since the Learning Center has only 16 computers.